Sheds and metal enclosed garages are a blessing and a curse! 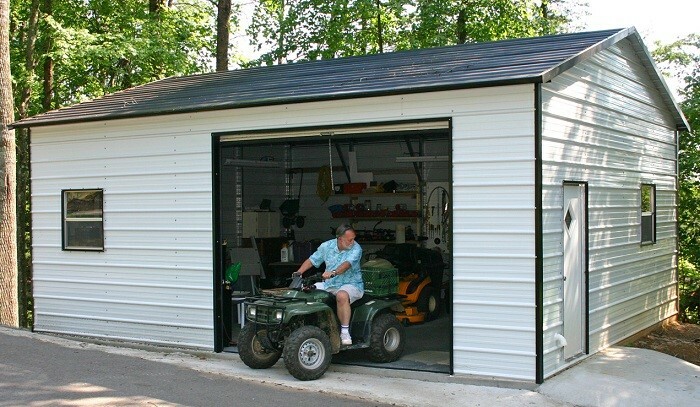 The garage stands to protect your car from the elements – keeping it dry from rain and snow -while in the case of a wooden shed, it’s a prime storage space for all of life’s extras. Without space in an attached garage, wooden sheds are the catch-all for tools, lawn equipment, outdoor furniture, kids’ toys, etc. But, over time, those wooden sheds and metal garages start taking on more and more of your stuff (also read as junk.) Kid’s old, unused toys start piling up, outdated decorations make their way there, and the piles of unorganized tools seem endless. – Before reorganizing, take everything out of the shed or garage so you can start with a clean slate. – Next, decide what to keep, what to donate, and what to throw away. – Group like items together so they’re easy to find. For example, build a tool workbench, designate a shelf for extra pantry items like toilet paper or drinks, and organize the kid’s toys to allow for easy access. – Use as much vertical and ceiling space as possible. For example, those beach chairs and sand toys that only get used one week out of each year – get them up and out of the way to make room for the things you need to access often, like the lawnmower. – Finally, label everything! This will ensure everything is returned to the proper spot and will keep things organized longer. Has this inspired you to transform the mess that is your wooden shed or metal garage into a usable space again? Spring is the perfect time, so head out there and get started!